The flowers of Wild Dagga contain leonurine, which has calming, mildly euphoric effects. You can dissolve this Wild Dagga extract in water, fruit juice, or yoghurt. This extract is 20 times more concentrated than dried Wild Dagga flowers. Contains 1 gram of dried Wild Dagga Extract 20x. In sealed plastic packaging. The dried flowers of the shrub Wild Dagga (Leonotis Leonorus, also known as Lion’s tail) contain the active agent leonurine. Leonurine relaxes the nervous system and has calming, mildly euphoric effects. For this reason, Wild Dagga is similar to cannabis, although it’s not quite as strong. Dissolve in water, fruit juice or yoghurt. Use 0.4 to 1 gram for one dose. 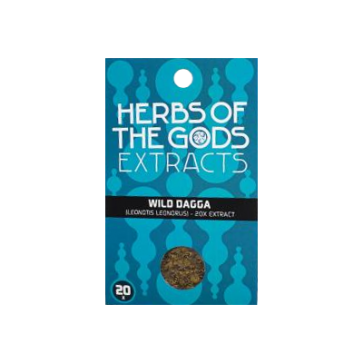 Wild Dagga is part of the lamiacae or mint family, just like mint, thyme and rosemary. It originates in the south and east of Africa. The South African Khoikhoi smoked Wild Dagga (sometimes combined with Kanna) for its calming effects, to reach a state of intoxication. The name Dagga was also taken from the Khoikhoi: in their language, “dachab” means cannabis. Wild Dagga is known for its beneficial effects on the heart and was traditionally used medicinally to treat high blood pressure, diabetes, dhiarrea, muscle cramps and tuberculosis. It also functioned as a talisman against snakes and for treating snake bites.